We’d love your help. 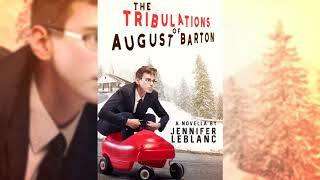 Let us know what’s wrong with this preview of The Tribulations of August Barton by Jennifer LeBlanc. "LeBlanc's coming-of-age tale about a nervous new college freshman is an odd, but charming blend of modern college life with an old-fashioned feel. Augie's personality is awkward, altruistic, and funny, and it's a pleasure to watch him grow as he and the other entertaining characters live through a sweet, relatively wholesome season." August Bar "LeBlanc's coming-of-age tale about a nervous new college freshman is an odd, but charming blend of modern college life with an old-fashioned feel. Augie's personality is awkward, altruistic, and funny, and it's a pleasure to watch him grow as he and the other entertaining characters live through a sweet, relatively wholesome season." To ask other readers questions about The Tribulations of August Barton, please sign up. A fast-paced impactful novella full of quirk. Augie, Grandma Gertie, Rose and Auntie Tunes are such wonderful characters. In fact, the entire cast of characters in this novella are fantastic, rich, and beautifully woven together. This story was certainly not what I was expecting! I was expecting it to be a little bit crazy, awkward and funny. What I actually got was all that and much, much more. I thoroughly enjoyed this book which at one point had me laughing and ugly crying. For a relatively short audiobook it certainly contained a full, well penned, funny and emotional story. Augie starts college and is absolutely dreading it. Especially when he meets his jock room mate. Augie likes Star Wars and has anxiety and panic attacks Isaac is loud and loves to party. While Augie planned to spend college keeping to himself, thanks to his growing relationships (especially with his wonderful grandmother) he actually finds himself, learning coping strategies to deal with anxiety and finds a determination to try to get the girl. Throughout this wonderful audiobook we meet Augie's mum Diane, his grandmothers best friend who is another ex-prostitute called Auntie Toons, a biker gang, and an elite restaurateur amongst other fantastic characters. He finds that first impressions are indeed not reliable and which is highlighted early on when he get to know Isaac a bit better. This is a funny journey through college life but what ultimately shines through is that it is a story of love, friendship, support and learning to take risks. I have 1 criticism- sound effects. I hate them in audiobooks and James Oliva is perfectly versatile enough to not need them. Thankfully there were not too many and I still thoroughly enjoyed Jennifer LeBlanc's charmingly and skilfully penned, journey. The narration was brilliantly done with consistent voice characterisation, expressions of mood and situation and along with the hugely talented writing of Jennifer LeBlanc a wonderful talent for bringing the funny and the emotional together seamlessly. What a fun and quick read that had me laughing and following along with Augie and Grandma Gertie. I found this story so engaging with Gertie helping Augie deal with his fear of coming out of his comfort zone. The secondary characters were an integral part of this story and the author did a wonderful job of developing them into Augie’s story. Even though you may not like reading books with teenage males being the main character, the author incorporates so much of the other characters that you end up being endeared to Augie and his crew of misfits! The only problem I had with this book is how quickly it ended. I wanted more of Augie and his antics! This is a great debut story from Ms. LeBlanc. I needed a short light story to add to my current reads and I found this book available on NetGalley. I decided to read it and see how intriguing it can get. This was a funny light-hearted story of August Barton, a teen who is suffering from anxiety and panic attacks. The story follows this teenager who is heading to college and experiencing several things for the first time. This novella is all about how relationships work between different people. You have Augie's relationship with his newly made friend in the college Isaac, then his relationship with his mother Diane and Grandma Gertie and his new love interest Rose. Although this is just a novella but I find the characters very interesting and well written. I love the ex-prostitute grandmother's character the most. She was funny and very witty and somehow sounded to me like the character Blanche Deveraux from the sitcom The Golden Girls, mince the prostitution thing of course. I would have loved if the story revolved around her more. I think her relationship with her grandson was really beautiful, but I think the author did not give much attention to the relationship between her and her daughter Diane. We don't know what went wrong other than Diane not approving the life style of her mom. Perhaps in the second book of the series we get to know more? Your first day as a college freshman can be nerve-wracking, for sure, but Augie really isn’t looking forward to it. Nerdy and shy, he isn’t the least bit prepared for his new roommate, the very loud and boisterous Isaac, and is scared to death of going to his first college party. Things back home—only 15 minutes away—aren’t great either what with his mom and stepdad heading for divorce and his mom’s mom, Grandma Gertie, stashed away in a nursing home. Augie is very fond of Gertie and she’s the r Your first day as a college freshman can be nerve-wracking, for sure, but Augie really isn’t looking forward to it. Nerdy and shy, he isn’t the least bit prepared for his new roommate, the very loud and boisterous Isaac, and is scared to death of going to his first college party. Things back home—only 15 minutes away—aren’t great either what with his mom and stepdad heading for divorce and his mom’s mom, Grandma Gertie, stashed away in a nursing home. Augie is very fond of Gertie and she’s the reason he’s planning to go into gerontology. Still, what’s about to happen with him and Gertie and a girl named Rose and Gertie’s pal, Auntie Tunes, is way beyond even his worst fears. I mean, how did he end up with Gertie as his date to that party? This story is pure fluff and I loved it, laughing all the way through. Ms LeBlanc has created the most motley and wonderful cast of characters, every single one of them coming to life but, what really seals the deal is the narrator, James Oliva. Holy moly, this man is fabulous with the most wide-ranging collection of voices I’ve ever heard and I immediately knew who each character was as soon as Mr. Oliva opened his mouth. Augie is moving into his college dorm room and is uncertain about his roommate and the experiences he'll have. He isn't exactly the popular type, he's a nerd with anxiety issues and doesn't know how to behave himself in social situations. Augie's grandmother knows a way to fix these issues though. Gertie is a retired prostitute with a widespread reputation and she knows exactly how she can get Augie out of his shell. She isn't prepared to let her grandson become a boring studious guy without any Augie is moving into his college dorm room and is uncertain about his roommate and the experiences he'll have. He isn't exactly the popular type, he's a nerd with anxiety issues and doesn't know how to behave himself in social situations. Augie's grandmother knows a way to fix these issues though. Gertie is a retired prostitute with a widespread reputation and she knows exactly how she can get Augie out of his shell. She isn't prepared to let her grandson become a boring studious guy without any friends. Gertie has plans for her grandson, but first Augie needs to break her out of her nursing home every time they go somewhere together. Gertie makes sure his first party is a success, she helps him with his love life and she has the most fascinating friends in interesting and useful places. With the help of his grandma college might not be so bad after all. Will Augie have a chance to make friends and win the heart of the girl he likes and what's the price he has to pay for hanging out with Gertie all the time? The Tribulations of August Barton is a delightful original story. Augie is adorable, he doesn't have sleek moves, but he's friendly, quirky and smart. He also treasures his grandmother and they're quite a pair. Gertie is a true spectacle. She has plenty of pizzazz, she still has looks, crazy people skills and plenty of pluck. She does whatever she likes and people love her for it. Augie and his grandmother are both main characters to fall in love with. They're wonderful and when they are together nothing is ever boring. I totally loved this amazing duo and enjoyed every single one of their adventures. I've been looking at this novella sitting on my shelves for a few months now. Pick it up the book would say. I was too busy picking up other things. Today I decided. Today is the day! So I started. A book that causes me to have emotions whether it be anger like "Animal Farm" or tears like this one deserves a high rating. This novella was great. 4.5 stars! August Barton is heading off to college for the first time. First time away from home. First time drinking, kissing, doing the tango. A bunch o I've been looking at this novella sitting on my shelves for a few months now. Pick it up the book would say. I was too busy picking up other things. Today I decided. Today is the day! So I started. A book that causes me to have emotions whether it be anger like "Animal Farm" or tears like this one deserves a high rating. This novella was great. 4.5 stars! August Barton is heading off to college for the first time. First time away from home. First time drinking, kissing, doing the tango. A bunch of firsts for our main character Augie who suffers from anxiety and just when we think Augie can't be awkward enough...bam he isn't. Augie is studying to be a Gerontologist. His grandma Gertie is is an old folks home and like he tells his roommate Issac, he doesn't LOOOOVE old people he just wants to make their way of life better. While in college August meets the girl of his dreams. Rose... his ballerina girl (she's not really a ballerina). The Tribulations of August Barton was a heartwarming story of love, family and friendship. It was everything you need in a tiny little package. This novella is only 141 pages. I laughed out loud a few times. Cried a few times and was truly happy when I finished the last page. Gertie, Tunes and Issac were all so good for August. They made him grow as a person. Everyone grew in this book, which was refreshing. "The brave man is not he who doesn't feel afraid but he who conquers his fear". That quote is this book in a nut shell. The Tribulations of August Barton was such a fun and light read. And I definitely needed that after reading Bully by Penelope Douglas. This novella takes place in a span of five months, and we follow our main character August and his Grandma Gertie through many adventures. We also get to meet quirky people along the way. A more in depth video review will be coming soon. Having previously read the paperback version, I was lucky enough to get a copy from the author. I thoroughly enjoyed this version. LeBlanc's writing and Oliva's narration come together wonderfully in this audiobook, giving an even better richness to the characters and tension during some of Augie's panicking moments. Reading The Tribulations of August Barton is a heartwarming and enthralling way to spend an afternoon. I enjoyed Augie’s story and how love, both romantic and familial, helped him learn and grow in unexpected ways. I can’t wait to see what the gang gets up to next! I give this book 4.5/5 big toy cars. This is a coming of age story of August Barton. Finally, he has the confidence to come out of his shell and do the things he never thought he would ever do. Of course, his new (mis)adventures were courtesy of his very cool and lively Grandma. What a hoot this book is. An absolutely enjoyable story that will let you forget your worries temporarily with all of Grandma Gertie's stories and antics. This story just proved that there's nothing wrong with hanging ou I give this book 4.5/5 big toy cars. This is a coming of age story of August Barton. Finally, he has the confidence to come out of his shell and do the things he never thought he would ever do. Of course, his new (mis)adventures were courtesy of his very cool and lively Grandma. What a hoot this book is. An absolutely enjoyable story that will let you forget your worries temporarily with all of Grandma Gertie's stories and antics. This story just proved that there's nothing wrong with hanging out with old people, some of them may just turn out to be just what our soul needs--a taste of adventure and penchant for breaking the rules. One thing that struck me in this story was Grandma Gertie's character. She is not ashamed of her being a former prostitute. I think she is even proud that she was the "Floozy of Freemont Street". I guess her saying that was without malice but with a conviction that she did her best during a very hard time. Hard times call for desperate measures. She rolled with the punches to survive. A very admirable trait. She also said that being a prostitute, she also tried to help the men who came to her. She listened to them and helped them navigate the issues and problems that beset them. To her, she did not just offer physical relief but also sorted out the emotional and psychological needs of her customers. But I am not advocating that it is okay to be a prostitute. In a way, I could relate to August. I was once shy and very unsure of myself. At times, I still am. I feel like I wanted the floor to swallow me whole, especially in very awkward situations. I did not have a strong self-esteem growing up. I never wanted attention directed at me. I would gladly hide in the shadows and be the one behind the scenes. So, I found it very easy to associate with August and how it feels to be in an environment outside of the comfort zone. Unlike August, I did not have a highly-spirited grandma who would push me beyond the limits of my safety and comfort. Whatever confidence I found now and love for adventure, I painstakingly have to work through and it helped a lot being around people who made me want to be the best of who I am. People who are oozing with positivity that I can't help but be like them. I learned one new term or word in this story--Gerontology, which I never ever heard before. If it's the first time you heard this word, them welcome to the club. Gerontology means the study of caring for old people, how to improve the ways to care for them. And if you are wondering how that came into the story, then better read this book. When I found out the relevance of this word to the whole tale, I was very surprised and felt that it was still premature to conclude, but I was already drawn to this cute, unassuming and clueless August character. I also loved the ending. It was a perfect ending of all the grand comedic endings of great proportions. I never saw it coming. I was absolutely tickled and it left me with a promise that more misadventures of August and Gertie and her cohorts are yet to come. More are coming and I am so so so freaking looking forward to them. I give this book 4.5/5 toy cars. I adored the characters of this story. They were perfectly written with very unique personalities in mind that were very memorable. Every time I think about this story or one of the characters, I would surely have a smile on my face as I reminisce the hilarious and shocking (I mean it in a good way) situations in this book. I can't help but shake my head in disbelief, at the same time, be amused at all the funny and awkward situations August had to face, compliments of his Grandma and her daring accomplice--Tunes. There was never a dull moment in this story. I would love to see this in the big screen. I am sure this is going to be a hit and a riot! I was right! Just looking at the cover and the title of this book, it already said a lot and it holds a promise (aside from the very fantastic ending) that you will never be sorry for picking up this book. ...how time was as infinite as the space above. The future shortly became the past and one could never predict how things would turn out. Oh my goodness I haven’t laughed at a book like this in such a long time. I thoroughly enjoyed this book. The author filled it with so many vivid and unique characters, I can’t imagine where she came up with them all or how she managed to seamlessly toss them together into a rich and entertaining story. The characters truly made this book, though the stories behind them come a close second. The relationship between Augie & Rose is one for the books, and the ever changing relationship between Oh my goodness I haven’t laughed at a book like this in such a long time. I thoroughly enjoyed this book. The author filled it with so many vivid and unique characters, I can’t imagine where she came up with them all or how she managed to seamlessly toss them together into a rich and entertaining story. The characters truly made this book, though the stories behind them come a close second. The relationship between Augie & Rose is one for the books, and the ever changing relationship between Gertie & Diane is one that, unfortunately, I think many people have experienced on some level. Including myself. And Roses journey is one that many have experienced in varying forms as well. I don’t think there’s a specific genre that I could place this in, so it will be one I’ll be recommending to many. The Tribulations of August Barton is a whimsical coming-of-age tale about Augie, a young man struggling to find his place in the daunting world of college. Aided by new friends and his quirky grandmother, he embarks on a journey to discover his true self. Better than what I was expecting. By a hundred. This short book, or should I say novella, was everything I needed right now. It's funny, heartwarming, everything! The author, Jennifer LeBlanc, has such a lovely writing style. You can vision each scene vividly, which I love. Now, I do not know much about American Colleges, as I live in the UK and went to university in Huddersfield. I do see that the 'party life' is slightly different, but I can feel August Barton's anxiety when it comes to attending parties. I was always, and still am, the 'awkward' one at parties, and I sort of saw myself in August, because of that. I loved August as a character; he's nerdy, studying as bizarre degree (Gerontology), socially awkward, he has everything! And I love him. My favourite character was Gertie. Gertie is August's Grandma and she is hilarious! The 'Floozy of Fremont street' is such a comedic character. At times, she reminded me of all my grandma's (I have 2 Grandma's, a step-nana, and a great grandma that sadly died in 2010). She is not only funny, but she is caring. She cares for her grandson, and even though her and her daughter did not get along very well, she still cared about them. I do wish this book was longer though. There were some scenes that felt rushed. For example, meeting Tunes. I think that whole section felt rushed, and the character wasn't as developed as other characters. Also, the chemistry with Gertie and Dianne, August's mother. I wanted to see more of them and their history. Also, the introduction of a character called Duncan, a child genius. I wanted more between August and Duncan, because those couple of scenes they are in together were amazing - you can feel August's frustration! But, I wanted more. That being said, I loved this book. It's got troubled romance, annoying but charming roommates, hilarious old people, family traumas! Everything in 175 pages! I cannot wait to pick up the second book and see how August is doing in his relationship, in college, to see how Gertie and Dianne are getting on. I am looking forward to reading it. August Barton is a young man venturing away from home to college and a world of experiences he’s not sure he wants. He’s plagued with anxiety and doubt that hold him back. In this coming of age novel the reader will meet “Augie’s” cast of family and friends who will keep you entertained. His grandmother definitely stands out as my favorite character. She’s a former working girl turned nursing home escapee and YouTube poster. The stuff she says is hilarious and I just love her role in his life. It reminds me when my own grandmother used to hang out with my friends in our 20s. This story is fun and relatable. I love the inclusion of anxiety playing a role in August’s life. I know this is something a lot of people will connect with. It gives the reader a firsthand experience of what anxiety feels like for some. It’s fun to watch August find his strength and confidence as he goes on adventures and has experiences, even negative, that begin to pull him from his shell. He finds a love interest that further pushes him from his comfort zone. I also adore is charismatic roommate, Isaac, who just won’t take no for an answer or let August shut himself in. Super cute, fast, easy read. Lots of laughs! Great book! Very funny and Heartwarming! Love Augie and Grandma Gertie!! I don't think I've ever laughed so hard before. Well, actually, I have. But that's besides the point. This book is simply amazing. It's funny, it's got its moments when it makes you think about possible consequences. And its got sweet romance wrapped in there. I adored Gertie, August's grandmother. She's a hoot, that one. Jennifer LeBlanc is an amazing author and I cannot wait to read more from her. I have read this book before, but I've didn't experience it quite like this. James Oliva did a fantastic job with his narration. It was like a movie. And though he's a little older, Augie reminded me of Adam Goldberg (The Golbergs). His voice did anyway. It was so well done. Each scene was describe and the proper emotion was felt. If the next August Barton book has this same narrator, I will not hesitate to add it to my library. The Tribulations of August Barton is far from my goto genre of choice, but that being said I enjoyed the heck out of this novella! From the first few paragraphs I was chuckling at Augie getting through his first days at college. Along with his hoot of a grandma, Gertie, you're introduced to a number of whacky and likable characters throughout the story. From funny to sad, to love and loss, I feel this novella checks all the boxes. This was a tender, funny, and thoroughly enjoyable read. LeBlanc has written a great coming of age story involving a male character (18) who she writes with surprising accuracy for a female author. Current or recent college students will very much connect with this book, but it's a great read at any age. Imagine every awkward encounter you ever had in your youth bundled up with your love for your family and your discomfort in your own skin. This is what readers will find in the endearing The Tribulations of August Barton by Jennifer LeBlanc. August Barton, or Augie as he is referred to most often, begins his story at a time of great change: he is moving into the dorms for his first year of post-secondary school. This is a time when many youths find and lose themselves while some cast aside thei Imagine every awkward encounter you ever had in your youth bundled up with your love for your family and your discomfort in your own skin. This is what readers will find in the endearing The Tribulations of August Barton by Jennifer LeBlanc. August Barton, or Augie as he is referred to most often, begins his story at a time of great change: he is moving into the dorms for his first year of post-secondary school. This is a time when many youths find and lose themselves while some cast aside their familial bonds and some strengthen them. The journey Augie takes to confirm his existence and how that relates to his unconventional family situation is sweet and relatable. This book is definitely a gem readers don’t want to miss out on. LeBlanc accurately describes the discomfort of being in the new environment of post-secondary school as youth come together and drift apart: relationships are made, tested and broken. It’s a difficult time for any person while those who experience anxiety disorders can view the situation in a completely different lens. Augie is the poster child of awkwardness and his self-perception will be relatable to many. He knows what he wants though, and he’s not afraid of admitting that. His tender relationship with his spitfire grandmother and the uncomfortable position he finds himself in as his parents divorce makes Augie more than just a character in a book: he’s relatable and human. The story itself is short and sweet. The writing is clean and easily digestible. This is a book that a casual reader could pick up and absorb on a lazy afternoon. The story is well written and contained nicely. There could be opportunity to expand the story and perhaps see more of Augie’s life and development but it’s not necessary. The simple joy that readers will find within the pages of The Tribulations of August Barton by Jennifer LeBlanc isn’t always easy to find. This wonderful story will tug on your heartstrings while making you laugh at the same time. The language is real and relatable which helps readers identify even more with the hapless protagonist they will find themselves falling in love with. Augie sets relationship goals for readers not only with the friends he makes but with the family he loves. He’s the kind of person you want in your corner and his compassion makes him unbeatable. This soul warming book is just what you want to read. When I started reading this book I wasn't sure what to think. Here was a young man starting out on the grown up world only to be followed there by his grandmother! Who by the way is a delightful human being and one of the funniest and heart warming characters I've ever had the pleasure of meeting. Augie is a darling and he faces so many of the thoughts and feelings we all have and often don't like to admit to. He deals with them in such a real and open way. I loved him from the first I LOVED THIS! Augie is a darling and he faces so many of the thoughts and feelings we all have and often don't like to admit to. He deals with them in such a real and open way. I loved him from the first page! After Jennifer has invited you into the world of Augie and walked her characters into your heart she presents a story that leaves you eagerly turning every page unable to stop! Definitely worth a read and I can't wait for the next one! This book was a surprising find. It was not at all what I was expecting, and that made me love it all the more. There were real and visceral moments of sadness, and satisfying depictions of joy. I can't quite believe how much story and character development the author managed to put into such a short book. The obvious love and respect for the elderly was endearing, and the anxiety representation made the book even more engaging. The characters were believable and well fleshed-out (Gertie was a f This book was a surprising find. It was not at all what I was expecting, and that made me love it all the more. There were real and visceral moments of sadness, and satisfying depictions of joy. I can't quite believe how much story and character development the author managed to put into such a short book. The obvious love and respect for the elderly was endearing, and the anxiety representation made the book even more engaging. The characters were believable and well fleshed-out (Gertie was a force of nature) and I can't wait to read more about them in the next book. A quirky coming of age story with a band of charming misfits of all ages. LeBlanc's characters are likeable while all struggling with their own challenges big and small. My only critique is that I wanted more ..... to spend more time getting to know the characters, their relationships and histories and to turn a few more pages. Award-winning and Amazon Bestselling Author Jennifer LeBlanc, was born and raised in South Dakota and has always had a knack for story-telling. When not slaying zombies in the gaming world or writing, she can be found getting lost in a good book, doing something crafty, indulging in photography, or watching movies with her husband, two cats, and chihuahua. Jennifer loves animals, poetry, music, an Award-winning and Amazon Bestselling Author Jennifer LeBlanc, was born and raised in South Dakota and has always had a knack for story-telling. When not slaying zombies in the gaming world or writing, she can be found getting lost in a good book, doing something crafty, indulging in photography, or watching movies with her husband, two cats, and chihuahua. Jennifer loves animals, poetry, music, and all things creative. She currently works in merchant banking and credit services while writing her next project. “How'd you know that would help, Grandma?